Nothing special but it does the trick. Had to put a coat of polyurethane on it as soon as I got it bc it was only roughly finished. That definitely improved things. Overall it was a good purchase but a bit over priced having now seen it in person. 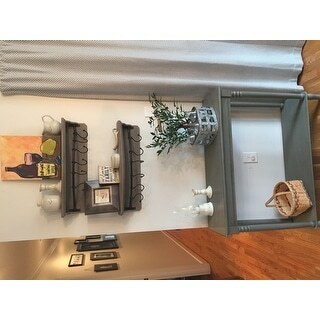 Add a charming accent to a bare hallway or wall with this classic console from The Gray Barn. Constructed from a sturdy combination of oak, veneer, and MDF, this sleek piece features intricate legs, a bottom storage shelf, and a beveled tabletop. Choose from three painted finishes to combine with your shabby-chic decor. 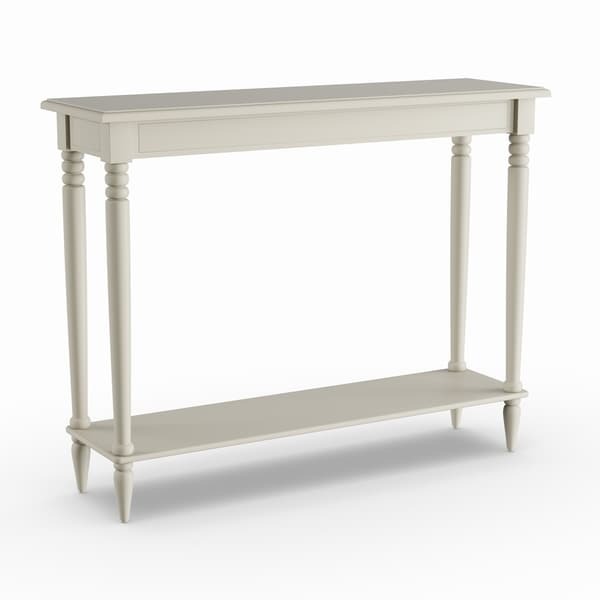 I had been searching for a small narrow console table for a while. This fits perfect in my space. Sleek and simple. As one reviewer pointed out, it is not white, but cream. I will be painting it white as I feel it stands out amongst my other white furniture. This piece was super easy to assembly which makes it worth the new paint job. Great price as well. This is the perfect table for a narrow space. I searched for a 12 inch wide table for at least a month before deciding on this. Not too bulky, not too old fashioned and not too modern. It took less than 15 minutes from opening the box to screwing on the legs and putting it in place. No tools required. It really is more of an antique green than blue. Great table at a great price. Couldn't be happier. Packaged very well, super easy to assemble and perfect for the small space I used it for. I placed it under existing shelves and added a dark glaze to tie the two together. I absolutely love it! And it was so easy to put together. Looks great in my kitchen! 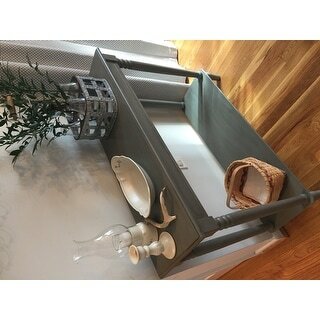 Nice-looking table in on-trend grey color, and smaller size makes it very versatile. Only caution is don't plan to put anything remotely heavy on the bottom shelf, it's not thick enough and I put some decorative glass bottles and the shelf is warping/bowing in the middle. We loved this table! It was easy to assemble. Perfect size and the color was spot on. I love how it looks behind my couch. It holds candles and decor very well and is sturdy. I would recommend this to a friend! I got this table in the off white. It is petite and narrow. A wall anchor is included for safety since it could be top heavy. It is perfect where I have it. The assembly was simple as you just screw on the legs. I would buy again. Very flimsy bottom shelf, I do not recommend putting anything heavy on it. The size is exactly what I wanted. I ordered the teal blue and didn't end up liking the color for my room, but my hubby painted it for me and now it's perfect. I would order the gray one next time. The table arrives flat packed and takes just a few minutes to assemble. Easy as pie. The look is traditional and fits well with my decor. As with all low-cost items it is not solid wood but that is indistinguishable unless you knock on it. Overall happy with purchase and can recommend with confidence. Perfect fit for what I needed in my hallway. Color is very nice! The packaging was crushed but the table was fine and easy to put together once I vacuumed up all the broken foam. like the narrow depth does not extend far into floor space. sturdy we now have it in our lani to hold electronics. Perfect fit for a narrow hallway. Took minutes to assemble. Love it. Cute table. Worked out perfectly. I bought 2 of these based on other furniture from the same manufacturer. Sturdy and super easy assembly. Large enough for table lamps, a good book and a cup of coffee! "The color options pictured do not match the color options to purchase. Could you please tell me if it is a teal as noted in the pictures or blue ? " There should be 3 versions. Antique white, Antique Teal, Eased edge gray. The Antique Teal it's called blue but the color in the picture is very accurate. I hope it helps. "Hi is the grey version appearing like a brownish grey. Is it s taupe grey or leaning towards brown?" "Is the 11.8 measurement of its depth, the entire depth? 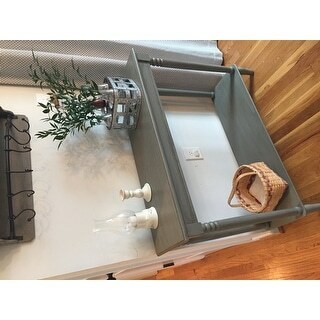 including the table top that hangs over its base? I have a narrow space and every tenth of an inch counts!" Yes, it is the entire depth, including the hang over. "How deep is this table? Looking for something around 12" deep for my hallway"
It just fits into a 12" deep space. The top is just shy of 12", about 11.8" deep. At the bottom, the legs just fit into a ten-inch space front to back. "Can you put this together so it doesn't have the bottom shelf?" My daughter put it together without the bottom shelf and it was still sturdy! "There are two different dimensions listed on this page. Which are correct? 37.7x11.8x31.5 or 28.25 x 11.8 x 28.25-Inch." Hello raineral, this is approximately 31.5"H x 37.7"W x 11.8"D. Thanks for shopping with us! I loved the simplicity, color and the price was right! It also had good reviews!! Wanted to use as a sofa table. Met my needs.